The Envoy 2 S Dual is the ideal solar powered audio Bible for those who are providing content in two languages and/or desire to provide the Bible along with accompanying teaching or commentary. MegaVoice is currently the only company that offers a side-by-side bi-lingual audio Bible that can instantly toggle between similar passages, books and chapters. The Envoy 2 S Dual’s keypad contains two extra buttons that toggle between the separated content. The Envoy 2 S Dual is best for ministries that need to load two different pieces of content and don’t require a recorder, FM radio, flashlight, microSD card reader or playback speed control. The Envoy 2 S is the ideal solar powered audio Bible for those who are providing content in only one language. It is the most simple and lowest cost solar powered audio player that can hold a full Bible or up to 800 hours* of audio content. The benefit of the Envoy 2 S is that it is Solar, Simple and Suitable for one language. The Envoy S has for years been the most popular audio Bible for many field applications and by those who are blind and visually impaired. The Envoy 2 S now brings a new level of durability and sound quality. *Dependent on the quality and size of audio files. The Envoy 2 ST is the lowest cost and simplest to use solar powered secure audio player available. Holding up to 30 hours of high quality audio, the ST is best used for shorter amounts of audio content, such as the New Testament, sermons, music, etc. The ST is often the player of choice for pairing with the MegaVoice Wildlife STORYTELLERS. The Wildlife STORYTELLERS have been used to bring the Message of hope, peace and love in a very cuddly and tangible way to those who are most vulnerable and often neglected. For more information, click here. The Envoy 2 ST replaces the very popular MegaVoice Story Teller unit on the more robust Envoy 2 platform, which provides superior navigation and the capability of replacing the battery. Listening to the Bible, Bible studies, sermons, music, educational content, humanitarian content, and much more! – Full Bibles, Bible studies, sermons, music, educational content, humanitarian content, and much more! For fastest charge, connect any standard “USB” charger (regulated +5VDC, minimum 300mA) to the micro-USB port on the player for about 2 hours (or until the LED stops blinking). While charging, the LED will blink. Plug the player into any standard computer USB port using a “USB to micro-USB” cable for about 4 hours or until the LED stops blinking. Any MegaVoice SLS, regular or charge-only cable is sufficient. For solar charging, place the player with the solar panel directly facing sunlight for 8 – 10 hours. Note, the LED light does not blink or show charging level when charging with the solar panel. 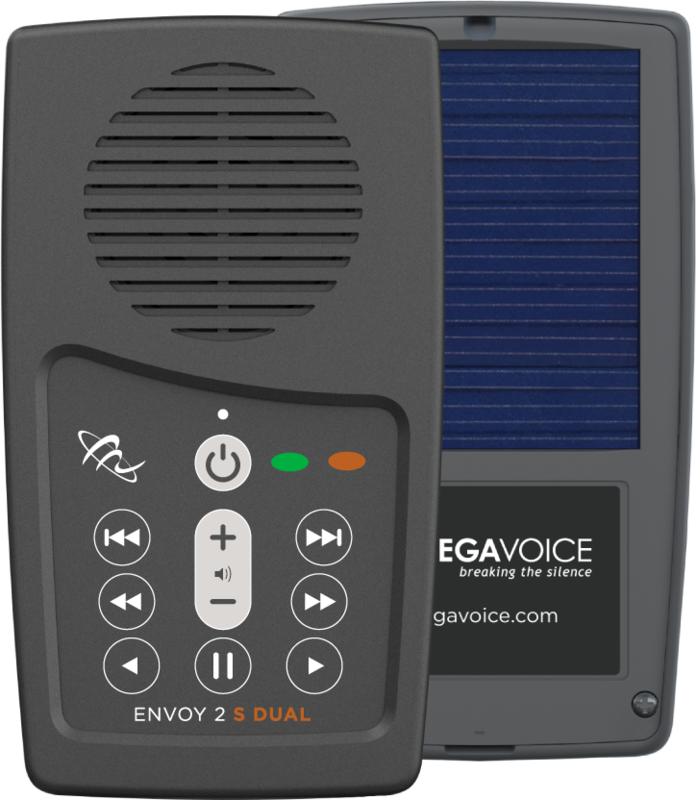 The Envoy 2 S Dual, S, and ST are advanced, solar powered audio players currently offered by MegaVoice. These versatile, multi-content* units comes fully loaded with an audio player, intuitive navigational keypad, 4GB or 512MB internal memory, onboard speaker, 3.5mm stereo audio jack, 390mAh internal Li-Ion battery, and a lanyard hole. With either 4GB (Envoy 2 S Dual and S) or 512MB (Envoy 2 ST) of internal memory, the Envoy 2 S Series has plenty of memory capacity. Navigation of large or small amounts of audio content has to be quick and easy, so we developed the intuitive, navigational keypad. Pioneered by MegaVoice in the 1990s, our keypads have evolved to best fit the needs of our users – children, elderly, blind and visually impaired people can confidently navigate hundreds of hours of audio Scripture with ease. Each player in the Envoy 2 S Series comes equipped with an onboard speaker (for small group listening) and a 3.5mm stereo audio port (for earbuds, headphones, an external speaker or even a Bluetooth transmitter). Need Scripture-based audio content? MegaVoice has content available in thousands of languages. You can easily search our expansive list of audio titles using the MegaVoice Audio Cloud search engine. Once you’ve found what you’re looking for, simply contact us and the MegaVoice team will load the audio content onto your players. Our team can load any number of players with up to 800* hours of audio content. Note that using a number of high-fidelity audio files, like those associated with music, will reduce the player’s total playback hours. Audio content on the Envoy 2 S Series players is tamperproof – meaning it cannot be modified or erased without using one of MegaVoice’s proprietary SLS cables. Loading new audio, or changing previous content, is executed via the USB port utilizing our free software, and the proprietary SLS cable which is available as an accessory purchase from MegaVoice. Partners can load one player at a time or use a USB hub to connect with multiple players simultaneously. The solar panel, included with each player, charges the internal Li-Ion battery making the players ideal for areas of the world where electricity is unavailable or unreliable. For those with access to electrical power, the Envoy 2 S Series players can also be charged via their micro USB port using an external power supply or a computer. Activating the battery reader feature will show how much battery charge is left. The LED light will blink green, yellow or red depending on the level of battery charge remaining. Each player is small, lightweight, and heat resistant up to 150 degrees. Used in challenging environments all over the world, MegaVoice audio players are renowned for in-field durability. The same robust, hard-shell technology deployed in our players for decades remains standard in the new Envoy 2 S Series. Enhanced water resistance is a new addition to each player, allowing safe use in wetter areas.